On the way to Hong Kong for the New Year’s holiday and stopped at the Singapore Airlines lounge at Bangkok’s Suvarnabhumi Airport. Tawn thought it might’ve interesting to combine the Häagen Dazs ice cream with espresso to make an Otalian affogato. Very nice beverage choice. 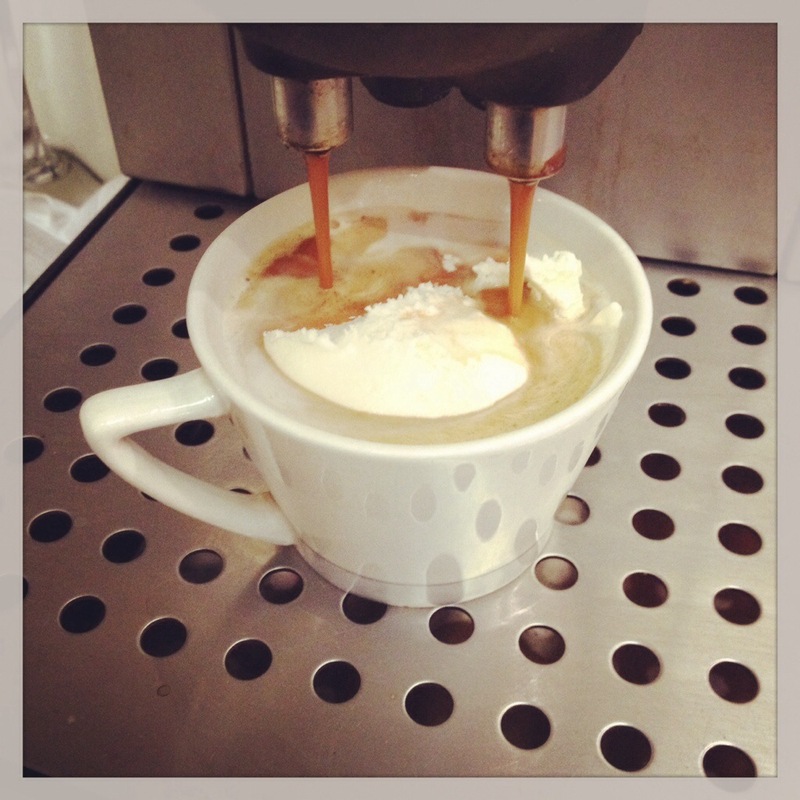 This entry was posted in Cooking, Travel and tagged affogato, beverage, Espresso by christao408. Bookmark the permalink. I remember making those when visiting my grandparents. We had the option of root beer and orange soda and I liked to alternate. I would very much like to be in HK right nowwwwwwwww. That looks good. That’s a great idea. I like affogato. How long you guys meeting up for? It sorta sounds like a Xanga meet up. You should go next year! Book your ticket now. I agree – next year we need to fill two tables. It is kind of. Well, ex-Xanga … not sure if Xanga is still alive. Take some pictures 🙂 The stalkers in us would like to have a look. It was a Xanga meet up or at least a “ghosts of Xanga past” meet up. Yes! So, it’s normally the time between Xmas and NYE? Well, this has only happened two years in a row, but it seems most people are there until the 31st or so. A few stay over until the new year. I for one would like to do it again next year. OK, gotcha. It’ll be nice to meet up again – and to meet some other Xangans. When I book my tickets, I’ll be sure to let you know, just incase you’ll be in the same place (I’m thinking Singapore, HK and Taiwan – but this is subject to change). Yum!!! That sounds decadent !!! Indeed it was. And caffeinated. Ooh, I might have to try that out! I usually put a bunch of milk in my espresso, anyway, but I use fat-free (it foams best). Ice cream doesn’t foam but sure adds a nice flavor to the espresso. So creative… I bet everyone in the lounge was looking at your creation! No, they had left to board the SQ flight to Singapore. We had the run of the place. Now that looks good and tasted good also? Tasted even better than it looked.